Last spring, I feel in love with Essie's Lapis of Luxury. I finally got around to purchasing it a few weeks ago (and have received a myriad of compliments since brushing it onto my nails). Over the summer, cool tones have been poking out of sandals at an increasing rate. In July, CS pal Morgan brought a bottle of Rimmel's Aqua Cool to the annual Charm School retreat on the west coast, direct from London. In minutes, every one of us had adorned our fingers and toes with this beautiful conrflower blue. It would seem that these watery tones are going to continue into the fall, with the biggest trendsetter in nail color, Chanel, launching their line of blues--"Les Jeans de Chanel" at Fashion's Night Out on September 8th. 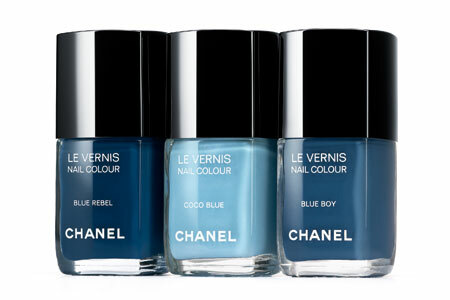 Each of the Chanel colors is named with a distinct personality : Blue Rebel (deep and dark for the daring), Coco Blue ( feminine, pretty and light), and Blue Boy (slightly more masculine with a 'washed' denim feel). Alternating the three tints and tones will achieve one of the season's other hottest nail trends--the ombre effect. Dark to light or light to dark; either way, these colors are cool. "a direct reflection of water and the life that it breeds. The ocean, the sky, greenery – plants, flowers, birds – all that frame mass bodies of water were key inspirations for this trend. The vibrant extremes that nature produces in the chlorophyll-rich plants to the iridescent feathers of sea-birds, the palette is made up of cool blue, teal and green tones".